Ten practical wedding budget tips that will help brides stay within their budget and keep wedding costs down when planning for their outdoor wedding. Pick a breathtaking location. Wedding by the lake, sunset wedding on a beach, wedding ceremony in a botanical garden -- the possibilities are endless. You don't need to worry about how to decorate the place. Mother nature already did it for you! Determine a set number of guests that you want to invite and keep to your list. Invite only immediate family and intimate friends. This is a big factor in keeping your wedding costs down and stay within your budget. Make your own wedding invitations. Look online and browse for Do-It-Yourself wedding invitations or you can go to your own local craft stores. You can also choose to make your own wedding invitations from scratch. My husband and I did our own. It was very involved and took a lot of time but it was worth it. Our guests were greatly impressed. Most of all,it helped us a lot to stay within our wedding budget. 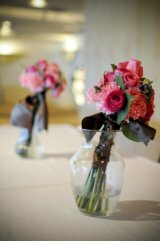 Keep your centerpieces simple but elegant. Make them yourself, it is not hard. You can check for ideas from local craft stores. Look online for great deals, check eBay and other auction sites. Oriental Trading is a great place to start looking. They offer great items for so much less cost. Look for inexpensive wedding favors. 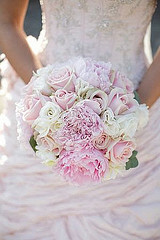 If you are getting married during spring or summer, you can have flower seed packets as favors. Another unique idea for favors is a personalized bookmark with a written poem, quotation or Bible verse that has a significant meaning for you and your bridegroom. Buy a wedding gown that is on sale. Get one during off wedding season (usually September to February) when the bridal stores are slashing their prices to make room for new inventories. Another option is to look for wedding gowns at online auctions like eBay. Try looking at classified ads too. Be open and try other avenues. Don't think that, just because you did not get your wedding gown from a wedding boutique, the quality will be less. Pick the bridesmaids dresses from a retail store as opposed to a wedding boutique or bridal stores, it is a lot less expensive. Your attendants will appreciate it too, since I am sure they have their own budget to consider also. When setting priorities in planning for a budget, wedding pictures and video usually top the list. Most couples do not want to skimp on this. Be wise when choosing your photographer and videographer. Since you are going to have an outdoor wedding, make sure that whoever you choose is very experienced and can work with natural lighting. Ask to see a previous client's pictures and videos for proof of their work. However, if pictures are not a priority for you and you don't want to pay too much for these services, then another option is to go to a local campus or university near you and ask a photography major student if he/she would do the service for you. Students charge a lot less than the professionals. Just be cautious and make sure that you are getting a good one. Ask if they can show you their portfolios. Placing a disposable camera in each table for the guests to use during the reception is another source of wedding photos. If used outside with good outdoor lighting, the results are great. Rent a classic car or a convertible instead of hiring a limousine for a bridal car. Have a friend or family member have the privilege of chauffeuring you around. This could cut down a lot on your overall wedding costs. Have your wedding events all in one place. Pick a nice country club for the wedding reception, set-up the wedding ceremony in their professionally landscaped lawn (they usually have gazebos too that you could use as a place to exchange vows) and have all the wedding party's photos in the same place too. This would save you a lot of time and effort, not just for you but also for the guests. After the ceremony, the guests can then proceed to the country club for cocktail while the wedding party can have their professional photos taken. Also, there will be no need to worry about providing transportation for the attendants since everything is done in the same location. If followed, these wedding budget tips can really cut down your wedding costs significantly. There are a lot more ways that you can do to stay within your wedding budget, especially if you are willing to compromise. Be creative, think outside the box.